It seems like only yesterday that there were only a handful of Texas titles in Arcadia’s collection. It was also yesterday that they had around 2,000 titles total. By now Arcadia’s small handsome volumes should be familiar to anyone with an interest in local history. If they don’t have a volume on your specific town – just give them time. 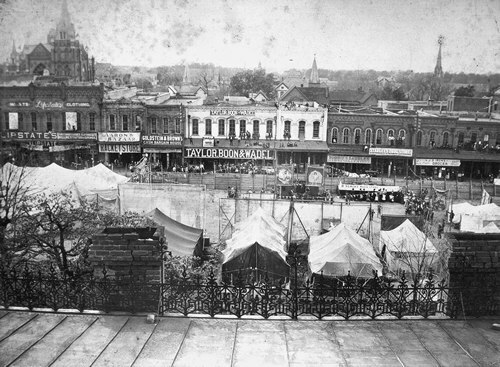 If they don’t have a book on your present town, they will almost certainly have one on your hometown or a place where you used to live, or one your parent’s hometown, or where you went to college or were stationed in the military…..
View of a circus parade circling the town square c. 1904 taken from the roof of the Smith County Courthouse. Photo Courtesy Smith County Historical Society. The secret to Arcadia’s success is to partner with local historians and authors – the people who know their subject best. In almost every case the photos included are the absolute best of private and institutional collections. They have been culled and culled again before appearing in Arcadia’s pages. Years ago counties wishing to publish there histories had to go to publishers who specialized in producing them or were scammed by fly-by-night “publishers” who collected monies in advance. If publication did occur, the reader was hit with a committee-made project with a $60 to $80 price tag. Arcadia’s plan is twofold: avoid the committee by utilizing dedicated authors and keep the cost down by selecting the best photos. Since they started, Arcadia has branched out on specific subjects. Sports, amusement parks, universities, neighborhoods and even the occasional business are now interspersed in their directories. However the backbone of their business remains small towns. In the event they strike a rich vein of photos and have an enthusiastic author, they can (and will) produce a volume on the town and another on the county. The county books allow the authors to feature towns too small to be featured separately. Or they can produce one book of photographs and another on the same town using vintage postcards. This was the case recently with Tyler. Historian Robert Reed authored his first book of Tyler photographs in 2008 and his second book was available in September of 2009. The two volumes complement one another but each stands alone. Austin, Burnet, Carthage, Big Spring and Howard County, Cherokee County, Cleburne, Corpus Christi, Corsicana, Del Rio, Denton, Donna, Dumas, El Paso, Ennis, Ft. Clark and Brackettville, Ft. Worth, Gainesville and Cooke County, Gilmer, Glen Rose, Goliad, Haskell County, Hemphill County, Hidalgo County, Huntsville, Hutto, Jarrell, LaGrange, Lampassas, Lee County, Luling, Marfa, Midlothian, Mission, Matagorda County, Nacogdoches, Oak Cliff, Pilot Point, Plano (they do have a history), Rockwall, Round Rock, Smithville, Temple, Tyler, Val Verde County, Waco, Waxahachie, and Weatherford. Content starts from the earliest maps, daguerreotypes and photos available and subjects run from picnics to Baptisms to hangings and from graduations to funerals. Disasters are always unwelcome guests at the historical buffet but tornados, floods, fires and train wrecks are included – as are occasional events like the presidential visits or forced landings of early aviators. Text is provided in captions to the photos. Complete enough to tell the story behind the photos but short enough not to bore. Since Arcadia is constantly moving on to new titles, it’s interesting to see how valuable some of their out-of-print titles have become. It would come as no surprise to find people speculating on certain books and their future availability. Arcadia has been very generous in sharing content with Texas Escapes and it’s a pleasure to recommend their good works to our readers.